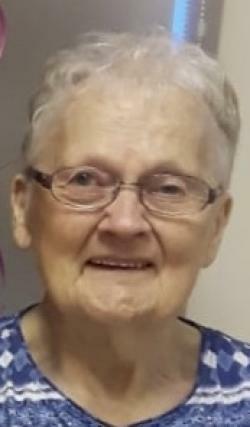 The death occurred peacefully at the Western Hospital, Alberton on Sunday, April 7, 2019, with her loving family by her side, of Blanche Shirley Hutt, of the Maplewood Manor, Alberton, age 80 years. Beloved wife of the late Kenneth Hutt, who predeceased her in January 2001. Born at Greenmount, PEI, on August 29, 1938 she was the daughter of the late Elmer and Grace (nee Gordon) Hamill. Loving mother to Brenda (Lennie) O'Meara, Alberton, Marlene (Johnny) Arsenault, Sea Cow Pond, Blaine (Shirley) Hutt, Northport and Karla (Jimmie) Fraser of Northport. Dear mother-in-law to Sandra Hutt of Sydney, Cape Breton. Cherished grandmother to, Jason, Jerilyn, Lisa, Natasha, Jillian, Jaime, Jody, Amy, Sarah, Melanie, Jenna-Vie, Sherilyn and Robbie. She is also survived by her 25 great-grandchildren. Dear sister to Fred Hamill of Northport and Guelda Matthews of Montrose, and sister-in-law Gertrude Hutt of Northport. She will be sadly missed by her many nieces, nephews, cousins and friends. She was predeceased by her son Blair, daughter Gwendolyn (in infancy), a sister Anita Matthews, brothers-in-law Clair Matthews, Fred Matthews, Bill Hutt, and by a sister-in-law June Hamill. Resting at the Rooney Funeral Home and Chapel, Alberton. Visiting hours Tuesday from 6:00 to 9:00 p.m. Funeral Wednesday morning from the E. Gerald Rooney Memorial Chapel for funeral service at 11:00 a.m., Rev. Darroch Fagan officiating. Interment later in St. Peter’s Anglican Church Cemetery. As an expression of sympathy memorials to the Rev. WJ Phillips Residence or to St. Peter’s Anglican Church Cemetery Fund would be gratefully appreciated.